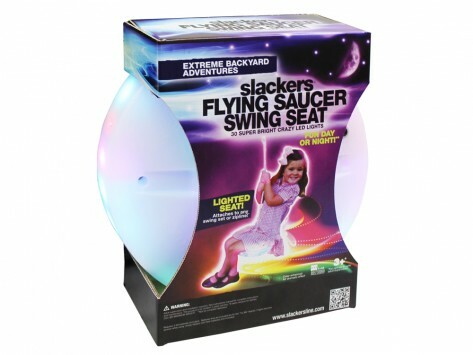 A great accessory to the Zipline kits, the Flying Saucer Swing Seat has 30 vibrantly colored LEDs and is easy to set up. Make ziplining a favorite nighttime activity! Maximum capacity of 250 lbs. Dimensions (in packaging): 12" x 12" x 6"
Getting kids to put down their electronics and play outside is a no-brainer when your backyard setup includes a slackline or zipline. Ed O'Brien, founder of Brand 44, tried ziplining in Costa Rica and was inspired to create the Slackers line of slacklines and ziplines. They’re made for backyard installations and designed for kids (and adults) who are just beginning to learn the ropes. 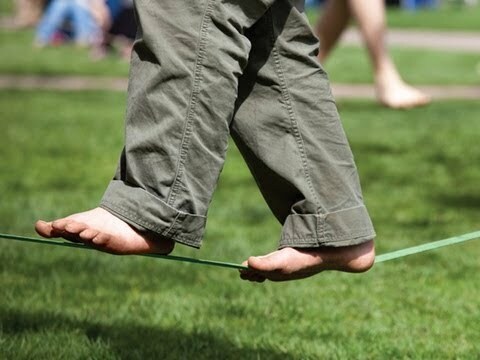 Slacklining is a fun activity that improves core strength and balance, but it takes practice. To ease the learning curve, Ed designed an overhead training line that kids can grab if they need help balancing. Once they learn the basics, kids can try more advanced tricks. To make his ziplines more accommodating for beginners, Ed added a seat so kids can zip between the trees with a little extra support. Brand 44 is dedicated to making outdoor activities more accessible to everyone, and the Colorado company’s slacklines and ziplines are a fun way to outfit your backyard for adventure without getting too extreme. But be warned: Getting kids off the lines might be tough once they discover how much fun they are.